Nations Press news GOODNEWS: PRES. DUTERTE WANTS EQUAL WAGES FOR METRO MANILA AND ALL PROVINCES! GOODNEWS: PRES. DUTERTE WANTS EQUAL WAGES FOR METRO MANILA AND ALL PROVINCES! SPONSORED LINKS As part of President move to spread development he will no longer focus on Metro Manila but also to Provinces. As many people choose to stay in Metro Manila for higher salary rate compared to other provinces which results to over population in Metro Manila. 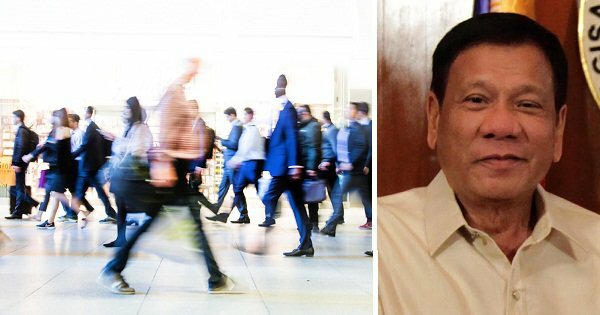 President Rodrigo Duterte wants to have equal wages to all provinces same as Metro Manila to resolved the issue of over population and any other. By implementing this, people from provinces will no longer travel to big city for higher salary, but instead to work from their own provinces.